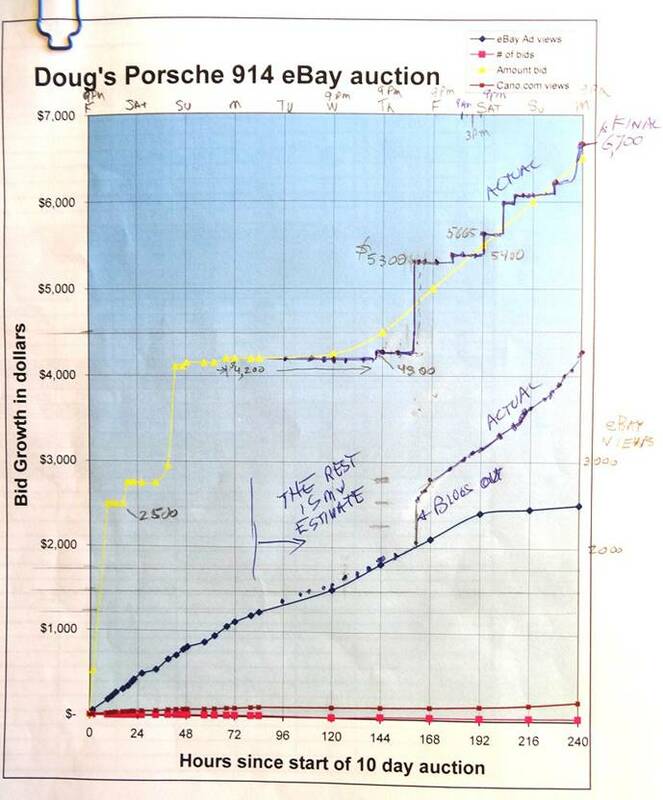 In late June we featured a 1973 Porsche 914 being sold by Doug Malewicki, aerospace engineer gone rogue inventor, biker and all around nice guy. The 914 sold for $6,700 to a buyer in Finland and as luck would have it, Doug wasn't far from DT HQ. Doug kindly offered to buy us lunch on the way to dropping his 914 off at the shipper. Doug picked up the tab (although he did bring a selection of coupons...hey, free lunch is free lunch, we aren't complaining!) and he shared with us a memorable lunch and an interesting graph of the auction results. Doug managed to shove a full sized road bike into the rear trunk on his 914 in preparation for a 45 mile bike ride home through scenic LA/OC drainage canals (as seen in Terminator 2.) Not only is Doug the inventor of insane things like the Robosaurus, but he is also an avid long distance biker, running machine and has been known to outrun autonomous robots from the future. Doug shared the above graph with us (fully aware we are major data geeks). The graph is a masterpiece of new meets old - it shows the partially excel, partially hand drawn data plots of an old-school engineer. Of particular interest is the uptick in dollars bid and number of ebay views at the 160 hour point when our story went live. The lower blue line is Doug's original projection and the actual shows a significant increase in views...great for Doug! 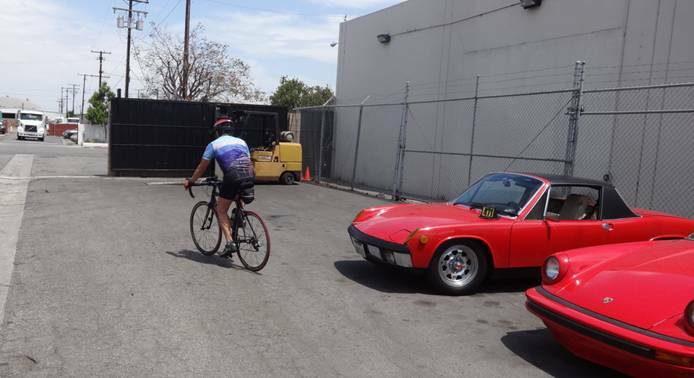 After lunch Doug dropped the 914 off with an international shipping company and started his 45 mile bike ride home. The 914 should arrive in Finland around the 2nd week in August and we hope to hear from the new owner soon. As for Doug...I'm sure we'll see his infectious smile and free spirit around. A 17% jump in one day? The "DailyTurismo effect" has a nice ring to it.